Come join us next week for the Better Block Christmas Market. Saturday December 20th, Team Better Block will be transforming a bit of Davis into a Scandinavian winter wonderland. The festivities will take place next to Lucky Dog Books (633 W. Davis). Come take care of some last minute Christmas shopping while enjoying some holiday cheer. Vendors will include ReGeared, Girlsewcute Jewelry and Nammi food Truck. 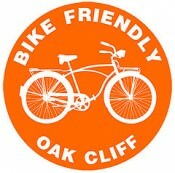 Bike Friendly Oak Cliff will be hosting a Christmas Lights ride that will cruise Oak Cliff in search of the area’s most spectacular lights. The ride will depart from the market at 6pm and will be approximately one hour long. See you there! ← DART d-Link to the Rescue!